I have spent my life around different languages. At home, though I heard mostly English, there was plenty of Portuguese being thrown around, especially when my parents were talking about us. When I wasn’t at home, I was usually found at my best friend’s house, whose parents were francophone Quebecois. Another friend down the road lived with her Ukranian grandparents. I befriended the foreign students, starting with the little Italian girl who started school with us in 2nd grade. After all this, it should come as no surprise that I have spent the last 20 years focusing my attention on languages and linguistics. When my oldest sisters started school, they spoke almost no English. After some time of watching her children become confused by hearing English at school and Portuguese at home, my mother decided that the best thing for the family would be to switch the home language to English. She did not want her children to have difficulty at school, and believed that dealing with two languages would only serve as a distraction and source of confusion for them. She wanted to make it easier to navigate this new culture and society she and my father had chosen to live in. As a result, I was born into a family that had made the transition almost completely into English, with the exception of certain kitchen commands, food terms, random traditional expressions, and ‘colorful’ phrases one would say when very angry at a small girl who has just broken the sugar bowl. I get a bit enthusiastic about the dictionaries. 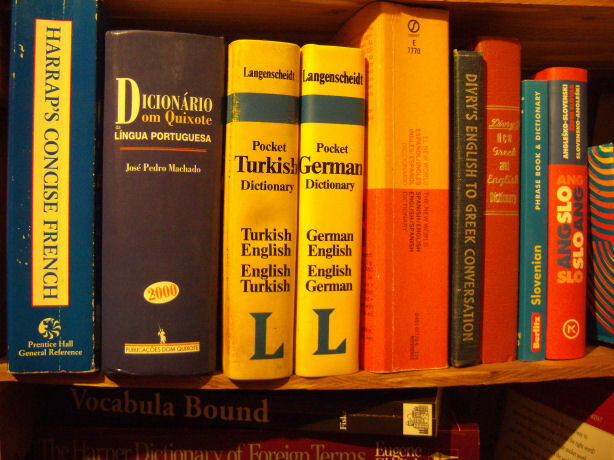 As a teenager and adult, I’ve had moderate success with second languages, but I longed for the same ease in another language as I have in English. I listen enviously to all the people I know who were lucky enough to have been brought up bilingual, and I wondered what prompted my mother – and many like her – to believe that maintaining her native language at home while her children learned English in school would have been a mistake. These days, people generally agree that there is an advantage to being bilingual. Some of the more common reasons given are pragmatic: being more marketable in an increasingly global economy, or having an easier time with international travel. Then there are more intangible benefits that are often cited: being ‘open-minded’ or accepting of other people; understanding concepts in one language that are difficult to express in another language; being more sensitive to cultural differences. These are all benefits to be sure, but they only scratch the surface. There are, however, demonstrable cognitive advantages that go beyond what many people may expect. The consensus of the past 20 years or so seems to be that the earlier children start to learn a second language, the better. But how is ‘early’ defined? In the United States, we generally start learning a foreign language around age 13 or 14, but at that age, we’re already working against the odds. In this online poll, 40% of respondents believe that children should start learning between the ages of 3 and 5. One commenter gave a reason for an even later start: “Personally I remember that I was still trying to get the hang of my primary language at age 5-6 (I mean, with a great grasp.) Mixing it up might make children confuse words from the foreign language with their primary language and it might become solid in the memory that way into later in life. I suggest waiting until around 7 or so, depending on how well he/she has finally grasped their primary language.” The second most popular answer, with 24% of the vote, was age 6-9, coming only slightly ahead of age 1-2 with 21% of the vote. This suggests that ‘early’ should definitely mean before age 9 at the latest, but possibly as early as birth. A 2008 study by Kovelman et al. was one of the first to look at the age of exposure and performance on reading tests in both languages. In addition, in order to maintain the focus on biological variables, they controlled for socioeconomic status. They found, “…despite all these similarities in SES, involving practice, instruction, home, school, and socio-cultural environments, we nonetheless observed statistically significant differences between the groups depending upon whether they had early versus late exposure to English.” In other words, not only may growing up bilingual give a child an advantage over monolingual children in literacy skills, but within their socioeconomic peer group, Early bilinguals still outperform Late bilinguals. In the brains of bilingual children exposed from birth to two languages, however, this hyperfocus on one language does not occur. The brain doesn’t ‘turn off’ to all other languages but its own. The conjecture is that this gives the brain a greater capacity for learning vocabulary in both languages, which then translates in later school years to increased literacy and general cognitive skills. “Indeed, Petitto says studies she conducted of bilingual children from some of the poorest neighborhoods in the United States showed that their reading capacity was the equal of unilingual kids from the country’s wealthiest enclaves.” The advantage, then, of bilingualism is so pronounced that it can make up for the clear disadvantages of socioeconomic class. Not only do Early bilinguals outperform their Late bilingual peers, but poorer bilingual children perform as well as wealthier monolingual children on literacy tests. Most of the focus is on babies or school-aged children, but recent research has shown that the advantage of bilingualism continues into adulthood, and may not only compensate for age-related declines in recognition and response speed in processing language, but can also help stave off dementia. With the overwhelming evidence that suggests that the best case scenario is learning two languages from birth, why would anyone who had the opportunity to give their children two languages opt for giving only one? Clearly, much of this understanding is relatively new, so people of my parents’ generation would not have been privy to this information. However, in the poll mentioned above, 2% of the respondents say that a child should never learn a foreign language. This means that even now in the 21st century, there is still some resistance to child bilingualism. What might be the disadvantages of a bilingual childhood that could outweigh the cognitive benefits? While I work on the research, tell me what you think! I live abroad and my two kids and I speak a second language. There are numerous benefits to knowing a second language, but I also think they’re less likely to develop a strong cultural identity as a result. It may not matter to them now, but I think they’ll have some regrets when they’re older. From our perspective of raising a bilingual French/English speaking child, I would say the current disadvantages (he’s 2 and 3 months) are frustration on the part of both parents and child due to slower speech development. While this is easy enough to accomodate at home, it is not always understood or taken into consideration outside of the home. This is particularly the case when it comes to the French nursery/education system. Depending on the character of the child, I have heard this can have a large impact psychologically, especially when it comes to self esteem. There is also the issue of how to main an equal level in both languages -this may require extra ‘work’ on the part of the child and add undue pressure at a young age. I think that delay in speech development is exactly what scares a lot of parents into thinking that they are totally screwing their kid. The probably think that the delay is going to be permanent and the child will never catch up to his/her peers. And like you said, even if the parents know what’s happening, they still have to deal with teachers, for example, who don’t understand. I wonder how many kids ended up in Special Education because some educational expert decided the child had a learning disability when in fact, the child was just in the process of sorting out their languages. Next stop: self-esteem issues! I don’t really have anything to contribute on the disadvantage front, but I will relay a story from my own experience. My sister was adopted at the age of 7 from Costa Rica. She had a very tough life, having lived on the street with an 11 year old sister for a time before entering an orphanage at the age of 4. She arrived in the US not knowing any English at all. My parents had a decent fluency in Spanish – I had no more than I had gained by osmosis via Sesame Street. My sister not only learned English very quickly and spoke without a hint of an accent within a year, she actually forgot her Spanish entirely. It’s like she wanted to completely turn her back on her troubled former life, right down to discarding her mother tongue. I imagine it’s still there somewhere, tucked away in her brain, but she’s never tried to unlock it. So even though she would easily have become bilingual, she chose a single language. I wonder how much of that was an emotional decision vs. finding that a single language was a more advantageous approach to all the change in her life. Language, I believe, is so tied to identity and I think you’re right: her choice to abandon Spanish entirely was a way of reinventing herself. It makes me wonder if the emotional stress of being bilingual could decrease or even negate cognitive benefits. At best, it may result in cognitive benefits that are never developed, and so what would even the the point? I think your parents were pretty great to give her a good home after such a rough life. Older children so often get overlooked in the desire of couples to adopt babies. A former co-worker of mine and her husband adopted two boys from Siberia – they were both toddlers, so younger than your sister, but old enough that language was an issue. I haven’t seen her in more than a year, and now I’m dying to know how they are doing! I love words - reading them, writing them, teaching them, mangling them... I also love photographs when words fail. As a Linguist by Leonore Rodrigues is licensed under a Creative Commons Attribution-NonCommercial-NoDerivs 3.0 Unported License.